If you thought retail was hot in 2017, you are correct–and this sector is poised to get downright sultry in 2018. This year, several technology trends are already dominating headlines, proving retail and tech have become enmeshed. All of this year’s top trends focus on making retail strategies more customer-centric, including knowing customers more intimately and elevating the speed and quality of service. Here are this year’s top retail trend predictions and implications for suppliers of all sizes to adapt to these market forces. More retail companies are investing in artificial intelligence (AI). This technology translates massive volumes of retail data into rich, actionable insights, helping retail professionals make smart decisions faster. AI simplifies arduous retail processes and delivers fact-based intelligence, helping retail companies save time and money, and serve shoppers better. AI helped Walmart.com’s assortment surge from 700,000 products in 2011 to 60 million in 2017.1Townsend, Tess. How AI helped Walmart go from 700,000 to 60 million items online. VentureBeat. October 23, 2017. Target shoppers can now use the AI-driven Pinterest Lens visual search tool to find products with ease, using Target’s e-commerce site and mobile app.2O’Shea, Dan. Target teams with Pinterest for visual search. Retail Dive. September 26, 2017. Online homeware store Wayfair has also adopted AI and machine learning for image-based search.3Terrelong, Zen. What the future of retail will look like, according to Google. Real Business. October 5, 2017. The power of voice: Voice-assisted ordering for browsing and buying will be big this year, led by tech titans Amazon, Google and Apple. For efficient shopping and product discovery, retailers offer a virtual assistant to power a smart speaker, which makes it easier for consumers to shop from home, using their voice. Industry experts predict 1.8 billion people will use digital assistants by 2021, and voice searches will account for half of all Internet searches within three years.4O’Shea, Dan. Grocers bring voice-assisted ordering to the store. Retail Dive. September 21, 2017. Beyond placing product orders, voice technology can help consumers discover sales, specialized offers, and store locations.5O’Shea, Dan. Grocers bring voice-assisted ordering to the store. Retail Dive. September 21, 2017. Voice shopping leaders include Amazon’s Alexa, Google Assistant, Apple’s Siri and Samsung’s Bixby. 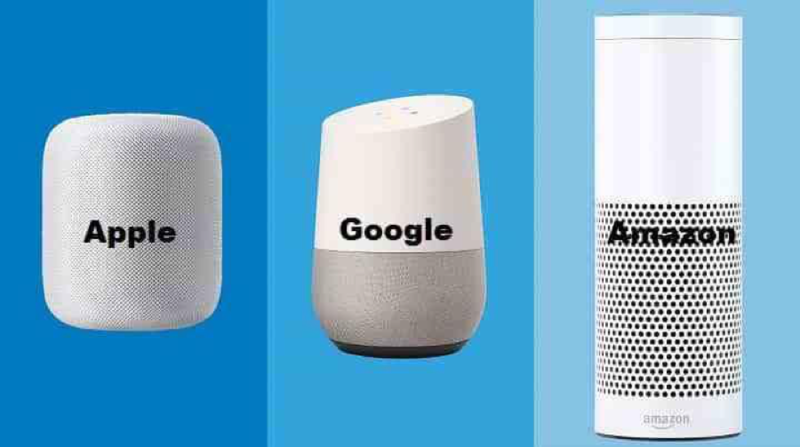 Amazon Echo accounts for approximately 75% of the smart speaker market, and more than 25% of searches now take place using voice-enabled devices, making connected homes a priority for retail tech leaders Amazon, Google, and Apple.6Duggan, Wayne. Amazon Destroys the Competition Again. U.S. News & World Report. January 9, 2018. In addition, Target and Home Depot partnered with Google to gain voice shopping capability.7 Perez, Sarah. Target expands partnership with Google on voice shopping, Google Express. TechCrunch. October 12, 2017.8O’Shea, Dan. Target teams with Pinterest for visual search. Retail Dive. September 26, 2017. Consumers increasingly crave the convenience of online grocery shopping. While the vast majority of grocery shopping currently takes place in physical stores, the Food Marketing Institute and Nielsen say U.S. online grocery shopping could grow five-fold to $100 billion by 2025. This prediction may be conservative, as experts made them before e-commerce giant Amazon acquired Whole Foods Market, igniting an urgency for more robust e-grocery strategies. To stand out in the increasingly crowded e-grocery space, German hard discounter Lidl sells award-winning wines and apparel from high-profile model Heidi Klum. Target recently cut prices on grocery products and other consumables and bought delivery company Shipt for $550 million to offer same-day delivery.9Wells, Jeff. Target cuts prices on groceries and other consumables. Food Dive. September 11, 2017.10Boyle, Matthew. Target to Buy Shipt for $550 Million in Challenge to Amazon. Bloomberg. December 13, 2017. Paradoxically, Walmart’s stores make e-commerce easier with buy online pick up in store (BOPIS) and buy online return in store (BORIS) policies. Walmart also acquired same-day delivery service Parcel and partnered with Uber and Lyft to compete with fast Amazon Prime deliveries.11Dodson, P. Claire. Here’s What It Takes To Win The Grocery Wars. Fast Company. September 18, 2017. Retailers collaborate with suppliers to create their own private brand, which can range from value to premium tier products, depending on their target markets. Private label helps retailers gain greater control over their supply chain and profit margins. It can also boost consumer loyalty and lifetime value per customer because the products are exclusive to a particular retailer. Walmart’s e-commerce brand, Jet.com, launched a private label line called Uniquely J. Focused on reaching urban millennials, the line includes grocery, pet, beauty and baby products.12Hirsch, Lauren. Jet launches its own private label brand, Uniquely J. CNBC. October 20, 2017. Kroger’s turnaround plan includes a strategy to aggressively grow three private brands, including an apparel line.13Halzack, Sarah. Retail’s Secret Weapon Is the Private Label. Bloomberg. October 24, 2017. Amazon expanded its private label athleticwear to directly face off against Nike, Lululemon, and Under Armour.14Green, Dennis. Amazon is coming for Nike, Lululemon, and Under Armour with its own sportswear brand. Business Insider. October 13, 2017. Last year’s Whole Foods acquisition added the popular 365 private label to Amazon’s grocery assortment, which also includes Happy Belly and Mama Bear private label groceries exclusive to Prime members. Savvy retailers no longer view consumers as faceless, homogeneous units within a larger target audience. Instead, they now invest in personalized marketing to create customized messaging and marketing offers that resonate at the individual level to spark engagement and action, including purchases. Personalization is in demand, as 79% of consumers want “brands that understand and care about me.”15Forer, Laura. Know Your Customers Better Than They Know Themselves: The Key to Customer Loyalty. Marketing Profs. October 13, 2017. Which retailers are the rock stars of personalized marketing today? Sephora, Net-a-Porter, Nordstrom, and REI are among the finest retailers when it comes to translating consumer data insights into customized marketing campaigns that resonate at the individual level – and drive sales.16Howland, Daphne. Sephora, JustFab, Walmart top personalization index. Retail Dive. September 18, 2017. In addition, the alliance between Walmart and Google will help the big box retailer gain deeper data insights, to understand consumers on an individual level and increase sales through meaningful marketing.17DiFranco, Stephen. Inside the Walmart-Google Partnership: Getting to Know Consumers on a Whole New Level. Entrepreneur. October 23, 2017. As retail gets more “phygital,” technology will continue to extend beyond e-commerce and into brick-and-mortar stores. To improve customer experience with greater speed and superior service, more retailers are investing in in-store technology. For instance, retailers with successful mobile point-of-sale (POS) services could boost their sales by nearly 150% this year.18Howland, Daphne. Mobile tech in stores could boost sales by nearly 150%. Retail Dive. January 9, 2018. 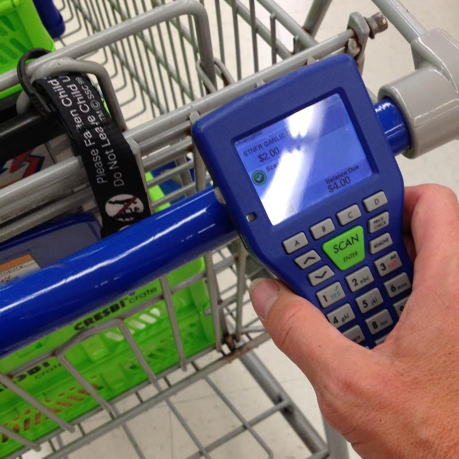 For faster checkouts, Walmart stores have been adding mobile “Scan and Go” technology for self-checkout to reduce costs, and help shoppers avoid checkout lanes, registers, and cashiers. Shoppers pick up an in-store portable scanner, scan the product barcode and pay using the self-checkout.19Harris, Sophia. Walmart ramps up self-checkout by letting customers ring in items while shopping. CBC News. October 22, 2017. Competitors Amazon and Kroger are developing similar technology. For instance, Kroger is rolling out its own “Scan, Bag, Go” service to 400 stores this year.20Peterson, Hailey. Walmart is taking a direct shot at Amazon and making checkout lanes obsolete. Business Insider. January 9, 2018. In addition to just-walk-out technology, such as Amazon Go, Gen Z consumers say they want stores to offer Augmented Reality (AR) and Virtual Reality (VR) to improve their in-store experience.21Salpini, Cara. Gen Z wants more in-store tech. Retail Dive. September 26, 2017. Retail companies apply technology and fresh thinking to their supply chain to deliver products to the homes of online shoppers. Supply chain partners – including logistics companies – have evolved to become the face of retail by literally greeting online shoppers face-to-face at their doorstep. Retail companies now prioritize how they deliver goods from the factory to the consumer to maximize speed, convenience, and quality of customer service. To leverage its abundance of associates, Walmart launched a pilot in which the company’s employees can earn additional money by using their own vehicles to deliver orders to online shoppers’ homes at the end of their shifts.22Soper, Spencer. Wal-Mart Asks Employees to Deliver Packages on Their Way Home. Bloomberg. June 1, 2017. Walmart also partnered with smart home accessories-maker August Home to give delivery drivers access to consumers’ homes to put groceries straight into their refrigerators, using a one-time smart lock and security camera.23Moon, Mariella. Walmart wants to deliver groceries right to your fridge. Engadget. September 22, 2017. Similarly, the Amazon Key smart lock and security camera will allow delivery professionals into Prime members’ homes to drop off packages.24Del Rey, Jason. Amazon will start delivering packages into the homes of Prime members. Recode. October 25, 2017. There’s even a driverless “meals on wheels” service that brings nourishment right to you. Self-driving mobile mini grocery store Robomart will bring grocery products to consumers’ doorstep with a white-labeled service for wholesalers and big-box retailers.25Shieber, Jonathan. Robomart is the latest startup to try and unseat the local convenience store. TechCrunch. January 5, 2018. In 2018, leading retailers will set new industry standards for customer-centric service, including technology investments that delight shoppers. Suppliers of all sizes need to be aware of these macro trends shaping the market, including how they impact the customer experience. This year, when negotiating with retail buyers, suppliers may want to emphasize how they deliver relevant benefits, including convenience, ease, efficiency and a competitive advantage that retailers seek in this intense, exciting time for retail. 1. ↑ Townsend, Tess. How AI helped Walmart go from 700,000 to 60 million items online. VentureBeat. October 23, 2017. 2, 8. ↑ O’Shea, Dan. Target teams with Pinterest for visual search. Retail Dive. September 26, 2017. 3. ↑ Terrelong, Zen. What the future of retail will look like, according to Google. Real Business. October 5, 2017. 4, 5. ↑ O’Shea, Dan. Grocers bring voice-assisted ordering to the store. Retail Dive. September 21, 2017. 6. ↑ Duggan, Wayne. Amazon Destroys the Competition Again. U.S. News & World Report. January 9, 2018. 7. ↑ Perez, Sarah. Target expands partnership with Google on voice shopping, Google Express. TechCrunch. October 12, 2017. 9. ↑ Wells, Jeff. Target cuts prices on groceries and other consumables. Food Dive. September 11, 2017. 10. ↑ Boyle, Matthew. Target to Buy Shipt for $550 Million in Challenge to Amazon. Bloomberg. December 13, 2017. 11. ↑ Dodson, P. Claire. Here’s What It Takes To Win The Grocery Wars. Fast Company. September 18, 2017. 12. ↑ Hirsch, Lauren. Jet launches its own private label brand, Uniquely J. CNBC. October 20, 2017. 13. ↑ Halzack, Sarah. Retail’s Secret Weapon Is the Private Label. Bloomberg. October 24, 2017. 14. ↑ Green, Dennis. Amazon is coming for Nike, Lululemon, and Under Armour with its own sportswear brand. Business Insider. October 13, 2017. 15. ↑ Forer, Laura. Know Your Customers Better Than They Know Themselves: The Key to Customer Loyalty. Marketing Profs. October 13, 2017. 16. ↑ Howland, Daphne. Sephora, JustFab, Walmart top personalization index. Retail Dive. September 18, 2017. 17. ↑ DiFranco, Stephen. Inside the Walmart-Google Partnership: Getting to Know Consumers on a Whole New Level. Entrepreneur. October 23, 2017. 18. ↑ Howland, Daphne. Mobile tech in stores could boost sales by nearly 150%. Retail Dive. January 9, 2018. 19. ↑ Harris, Sophia. Walmart ramps up self-checkout by letting customers ring in items while shopping. CBC News. October 22, 2017. 20. ↑ Peterson, Hailey. Walmart is taking a direct shot at Amazon and making checkout lanes obsolete. Business Insider. January 9, 2018. 21. ↑ Salpini, Cara. Gen Z wants more in-store tech. Retail Dive. September 26, 2017. 22. ↑ Soper, Spencer. Wal-Mart Asks Employees to Deliver Packages on Their Way Home. Bloomberg. June 1, 2017. 23. ↑ Moon, Mariella. Walmart wants to deliver groceries right to your fridge. Engadget. September 22, 2017. 24. ↑ Del Rey, Jason. Amazon will start delivering packages into the homes of Prime members. Recode. October 25, 2017. 25. ↑ Shieber, Jonathan. Robomart is the latest startup to try and unseat the local convenience store. TechCrunch. January 5, 2018. Wow, it has some most crucial eCommerce trends in 2018. Especially I like the portion of E-Grocery. I really enjoyed reading your writing. 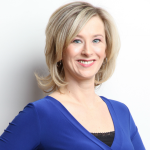 Hi Lisa Goller, You have added some of the very crucial ecommerce trends in 2018. It will be so much helpful for those who sell online. However you add “high quality product photo” in the trending list. That is also a crucial part in ecommerce still in 2018, I think. Thanks so much. Lisa, thanks for putting this together. LinkedIn just alerted me to this (from six months ago). Anyway, the private label and the last mile trends are very interesting to me. As a consumer I like the environmentally-friendly idea of workers bringing my purchase to me on their way home – saves on time and gas. As a brand, the private label is of interest to augment online and direct sales channels.